I just read the first couple of chapters and it is great so far! I'm review the whole series this week on my blog! I've really enjoyed them as a fun/easy/guilty pleasure kind of read. 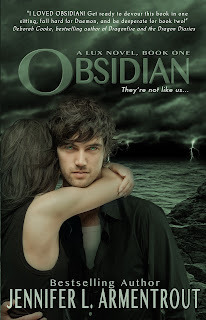 I like that the main character has an interest outside of the romance (books/blogging) and that she stands up to Daemon when he gives her a hard time. I think the books are really fast-paced and there's great romantic chemistry! LHughes, I will have to check out your reviews! Thanks for the follow!